As we lurch from one global crisis to another people are increasingly fascinated by what is coming next – and no more so than in Russia, which has produced some outstanding dystopian works since the fall of the Soviet Union. Although North Korea is one of the last outposts of 20th century style totalitarianism, dystopian fiction is as popular as ever. 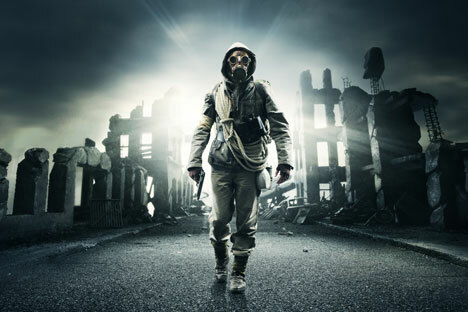 From the risk of a global pandemic to nuclear weapons falling into the hands of terrorists, the human race has plenty to fear. Nature is under threat from the advent of global industrialization, and technology is making it easier and easier for our governments to spy on us. Where will we be in another 50 or even 20 years? Historically, the genre of utopia/dystopia has been under-represented in Russian literature. There is Chernyshevsky’s “What Is To Be Done?” Zamyatin’s “We,” works by the Strugatsky brothers and Platonov, but not much more. However, that all changed with the fall of the Soviet Union, when the removal of state censorship allowed the genre to flourish. Many gems are already available in translation and are a must-read for fans of dystopia. Glukhovsky’s post-apocalyptic debut novel was a bestseller when it came out in Russia in 2007 and was made into a very popular computer game. Its sequel, “Metro 2034,” was equally successful. The Metro Universe is set in a post-nuclear Earth with the remaining survivors lurking in subterranean tunnels. The biggest is the Moscow Metro, where all the stations are like mini-countries and chaos reigns in the dark tunnels themselves. Abkhazian writer Fazil Iskander has written modern classics of both Soviet and Russian literature and is known for his unparalleled humor and satire. Vladimir Makanin’s “Escape Hatch” is a novella that juxtaposes two worlds. The first is the intelligentsia’s fragile refuge – an underground bunker – while the rest of the world is the overground city, devastated by wars and conflict. The escape hatch is the only connecting point between them. This book reminds me of the idiom “to bury your head in the sand.” If we hide away from the world, eventually there’ll be no way back. The narrowing escape route is a metaphor for the painful extinction of a beautiful animal who fails to adapt to an abruptly changing environment. When it comes to dystopia, we can’t leave out Sorokin, a modern giant of Russian literature who has been writing in this genre for a decade. “The Day of the Oprichnik” portrays Russia in 2027, a country that has become a twisted, military dictatorship in the style of Ivan the Terrible where the population is terrorized by the Oprichniki, the medieval secret police. The political satire is enhanced by the novel’s stylized prose that mimics archaic Russian, and the many historical parallels in the book emphasize the fact that Russia has, in fact, not changed at its core and has the same attitude to its people. The novel was followed by its sequel “The Sugar Kremlin.” The books have won prestigious awards in Russia and were nominated for the International Booker Prize in 2013. Tolstaya a living master, the golden standard for the Russian language. She presents the world after a nuclear apocalypse, when most technology, culture and language have been wiped out. In post-nuclear Russia villagers live like animals – and often look like them, with atavisms like horns and tails appearing among the people – but the scariest thing is the Slynx, a forest-dwelling monster and a metaphor for fear of the unknown. The few books found after the Explosion are taken from people and stored in a book depository, where Benedict, the main protagonist, works. He reads books and copies them by hand to preserve them – randomly, from children’s literature to specialized technical guides. Just because he reads a lot does not mean he understands what is written, and Benedict is unable to educate himself enough to see the world around him; despite being obsessed with books, he still lives like a caveman. So, the people who govern and have access to all the information don’t necessarily preserve our culture. Pelevin is another towering figure in Russian postmodern literature and has written a couple of dystopian works. “The Yellow Arrow” is a railway-themed allegorical novella. The train, a metaphor for Russia, which encompasses the entire world for all the characters, is heading towards a collapsed bridge. If Russia has ever known quiet periods, they were just ebbs, a time when worries briefly receded before the coming tsunami.